Pu-erh tea drinkers value Pu-erh tea which has been aged for a long time. 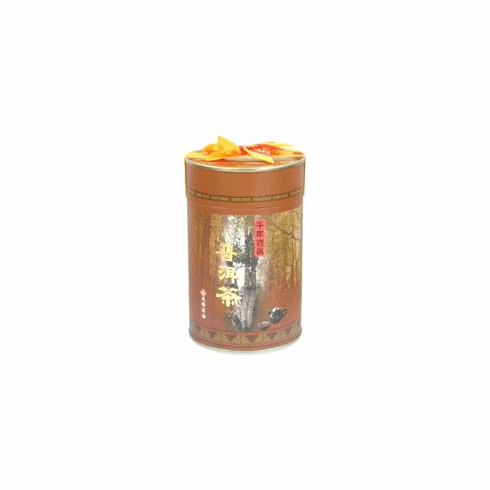 The Hundred Year Laocong Pu-erh Tea has a different aspect of aged Pu-erh tea. Instead of the finished tea leaves being aged, Hundred Year Laocong Puerh uses tea leaves harvested from aged and ancient tea trees. The tea plant, Camellia Sinensis, are usually cultivated and pruned to the size of a bush. However in the wild, the Camellia Sinensis tea plant can grow into a tree and some of these trees can live for hundreds of years. Hundred Year Laocong Puerh tea is produced from tea leaves harvest from these aged and ancient tea trees. Laocong means ancient tree in Chinese. The finished tea leaves and the taste of the tea is different from the typical Pu-erh. When brewed, Hundred Year Old Laocong Pu-Erh Tea produces a dark tan soup with a strong earthy aroma. The taste is moderately earthy that continues into a mildly astringent aftertaste. The water used to steep this tea should be at the boiling point, 212�F (100�C). Use about 2 teaspoons (3 grams) of tea leaves for about every 5 ounces (150 milliliters) of water. A steeping time of about 3-5 minutes is recommended with more or less time depending on the desired concentration. Net tea weight 1.76 ounces (50 g) and shipping weight 0.4 lb. Temporarily out of stock.